Clay, his older brother, my wife and I spent the day at my parent’s house, one of the few homes we visit that calms the little guy. The open floor plan and lack of clutter seems to work for him. He’ll circle through the living room, kitchen and dining area, check out the den, then retreat to the quiet of their finished basement, where he spends most of his time. You always need that escape room. After a few hours of him wandering while we stuffed our faces and caught up with my family, Clay’s usual steady line of patter turned agitated. The keyboard was retrieved. Enough socializing, let’s get to the pool. The shared pool in my parent’s community is generally filled on a Sunday afternoon with seniors and their grandchildren. We knew that would be especially true on a Father’s Day when the temperature had reached into the 90s. When we arrived, there were a few leather-skinned seniors sunning themselves in chairs at the far end of the pool like so many lizards. God help you if you splash this visor-wearing subspecies. Their forked tongues slither through their cracked lips and unpleasant things follow. We settled as far away as we could at a table under an umbrella, strapped Clay in his vest and set him loose upon the waters. 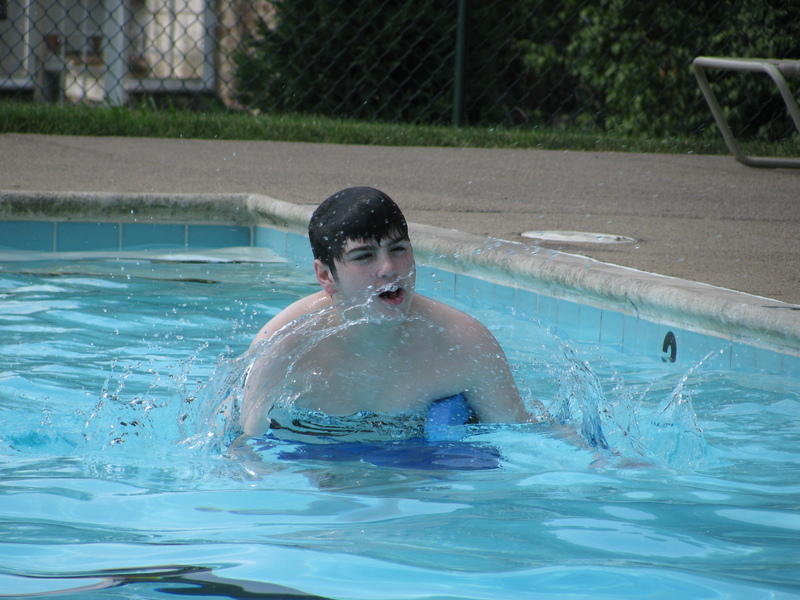 Clay is an enthusiastic swimmer, although he doesn’t know any official strokes. He splashes, he jumps up and down, he waves his arms, he plunges his head under. All of this is accompanied by loud squeals and equally loud reciting of phrases from Dr. Seuss. (“My name is Sylvester McMonkey McBean” was clearly audible three states away.) A demonstration of pure childlike delight that warms a parent’s heart. People trying to relax nearby don’t always find it so thrilling. About 30 minutes later, the crowd began to swell. More heavily tanned seniors. More spoiled grandchildren splashing and whining. One elderly man who was swimming laps would stop to talk with Clay when he got to our end, holding his hands and jumping up and down with him. Everyone else kept their distance. A teen who had been lying in a lounge chair nearby when we arrived, surreptitiously moved back with her family. Clay had half of an Olympic size pool to himself, while about 10 or 15 people huddled at the other end. Inevitably, one gray-haired geezer standing in shallow water, whistled and yelled at Clay to keep it down. My wife was not pleased. This is a woman who I watched curse out a drunk standing in front of our car at midnight while we attempted an ill-advised short cut through an urban landscape that looked like Dresden after the bombing. My life flashed before me once again. I told her I would talk to the man, if it kept up. Mercifully, for him (and me), he didn’t make any more comments. The crowd kept growing. The honeymoon was over. We lured Clay out of the pool with the promise of some juice and hustled him back to my parent’s house, leaving the pool to the mob, and that one agitated 80-year-old. I think I could have taken him, but I’m glad it didn’t come to that. This entry was posted on June 25, 2010, 3:29 pm and is filed under Daily Life, Silly Behaviors. You can follow any responses to this entry through RSS 2.0. You can leave a response, or trackback from your own site.